NordicTrack C 9.5 Elliptical Review by Industry Experts! The NordicTrack C 9.5 Elliptical Is On Sale! The NordicTrack C 9.5 is a definite value buy at $999. It is a front drive elliptical, which means that it is more compact and easier to mount. What makes this machine a stand-out is the 7″ Smart HD Touchscreen display, optional iFit technology, a 25 lb flywheel and a generous selection of 32 workout programs. You are not going to find any $999 elliptical, except for the rear drive NordicTrack rear drive SE7i, with as many upgrades and leading edge technology. This is not your typical elliptical trainer, it is also a motivational fitness machine. MID-WEEK SALE ENDS THURSDAY: The NordicTrack C 9.5 is priced at $999 with Free Shipping. No interest financing available. iFit Coach Ready —iFit technology along with a web enabled touchscreen is a great combination. The iFit program allows you to create your own custom workout programs using audio coaching from certified trainers. The workouts increase in difficulty over an extended period to help you gain real results. An online profile allows you to set your goals and track your progress. 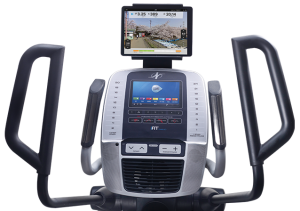 In addition, the machine can sync with Google Maps to let you simulate working out on your favorite real-life routes. Also included is an iFit wearable for on-the-go tracking that can be used on and off the incline trainer. This allows you to track all your physical activity throughout the day. In addition, there is an extensive library of virtual workouts that you can view on the full color display. For example, you can walk the beaches of Hawaii, or hike the mountains of Switzerland, and in the process you get audio coaching. What makes iFit virtual training so impressive is that your elliptical will mimic the terrain of the video by increasing the intensity of your workout. And there is more. You get Custom Meal Recommendations based on your calorie burn and You are able to track your workouts and your progress with helpful charts and stats. Studies show that individuals that track their workouts are more likely to achieve their fitness goals. Note: At the time of this posting, a FREE 1-year iFit Membership comes with this machine. After that initial year, there is an addition subscription charge to use the features. 7″ Smart HD Touchscreen – This is a fantastic feature that you won’t truly appreciate until you have it in front of you. Use this screen to access your iFit.com account with the touch of a finger. Integrated Tablet Holder – If the touchscreen isn’t enough to keep your attention, the tablet holder will provide a safe place for you to display your additional smart device. 0-20 Degree Power Incline – This machine will adjust with quick select buttons. Increasing the incline helps you target different muscle groups for a more effective workout. If you also want a decline feature, you’ll need to buy the more expensive NordicTrack C 12.9 elliptical. 25 lb. flywheel – This is a mid-weight flywheel for Nordictrack. They have a few machines that have 28 or 32 lb flywheels, but many that have lighter wheels as well. This will allow for a smooth and natural elliptical motion. SoftTouch Upper Body Grips – These grips are easy to hold for people of various heights. Switching your arm position will also help you activate different arm muscles. Lifetime Frame, 1 year Labor and 3 year Parts Warranty – For comparison, the NordicTrack C 7.5 only allows for a 2 year warranty on parts. Read an article comparing the NordicTrack C 9.5 to the Sole E25 and NordicTrack SpaceSaver SE7i here. The NordicTrack C 9.5 Elliptical Trainer is a budget machine at $999, which means it is best for low to moderate weight users. Still, it’s a great value in this price range with its web enabled touchscreen and iFit technology! The 25 lb flywheel is a mid-weight wheel from NordicTrack. They offer a few machines that have 28 or 32 lb, but many that are also 20 or 18 lbs. A heavier flywheel helps create a smooth and natural elliptical motion. We really like this compact little machine. 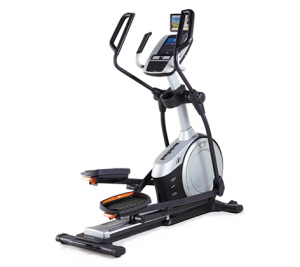 Check out a comparison chart of all NordicTrack Ellipticals here. Go to NordicTrackEllipticals.com to learn more about the NordicTrack C 9.5.